Lightweight plastic doors and bolted top sheets make service quick and easy. Plastic, lightweight doors provide resistance to rock damage and are easier to open than original metal doors. Bolted top sheets replace an original welded design and can be removed for increased accessibility or replaced in case of rock damage. 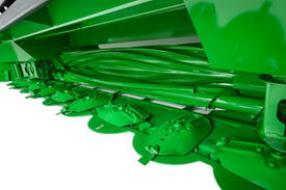 The overshot cross auger delivers increased performance in windrow formation and cut quality. Improved crop flow from the edges of the platform toward the center provides an even flow into the conditioner creating more uniform windrows. 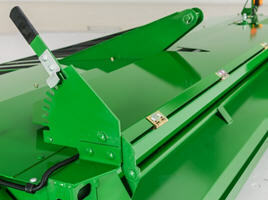 Additionally, crop is lifted off the cutterbar faster for improved cut quality in downed crops and reduced crop recut. The overshot cross auger features cupped flighting with a long pitch. The cupped shape makes the auger more aggressive in pulling crop from the edges of the platform and the converging drums. Moving more crop from the edges of the platform toward the center delivers increased windrow uniformity helping to reduce dry down time. The center flutes of the cross auger have an aggressive edge to help lift crop off the cutterbar and feed it faster into the conditioner. 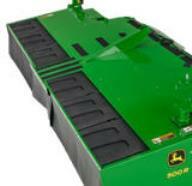 This improves crop quality in reducing the potential for crop recut. Moving crop faster into the conditioning rolls increases the overall capacity of the platform enabling faster cutting speeds in heavier crop and more acres cut in a day. The 500R offers choices of conditioners to meet customer needs. Varying crop types require different conditioners to deliver maximum performance in terms of window formation, cut quality, and dry down time. The urethane roll conditioner works well in legumes, especially alfalfa and most all-grass crops. In general, roll conditioners are better suited for thick-stemmed, cane-type, and taller grasses more than 1.5-m (5-ft) tall. Molded urethane rolls are formed by a cool molding process that does not distort or warp the steel core of the roll, ensuring the rolls are arrow straight and cylindrical, so they can be accurately spaced close together for uniform conditioning along the length of the roll. The intermittent recessed-cleat design gives more crimping edges for greater pressure per square inch, which results in superior conditioning and faster crop drying. An adjustable swath board is included with the urethane conditioner roll option. An adjustable swath board is included with the V-10 steel conditioner roll option. These rolls are well-suited for use in alfalfa where reduced curing time results in less bleaching of the crop. 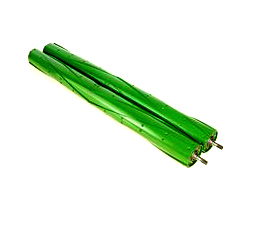 In heavy, thick-stemmed crops, such as sudan or sudex, the steel construction of the rolls does a very good job of breaking up the nodes on the stems to improve dry down. The shafts on the Tri-Lobe rolls are steel forgings that are then machined. These precision parts have minimal runout, which means the rolls themselves rotate precisely around their axis. This precision enables the rolls to be adjusted to a minimum clearance for consistent conditioning along the length of the rolls. For serviceability, each roll end has two threaded holes so bolts can be used to pull the shafts from the steel core of the roll. An adjustable swath board is included with Tri-Lobe conditioner option. The cutterbar consists of large oval disks with free-swinging knives. The knives are designed to retract when striking solid objects, reducing the potential for damage and delivering increased uptime. Wear caps, crop accelerators, and strippers deliver improved platform performance and lowered cost of operation in improving component wear life. Knives are reversible to double the useful life and are removed and replaced at the front of the cutterbar for ease of serviceability. All cutting discs and knives are identical, making servicing simple and reducing the number of different service parts to have on hand for replacement. The discs are computer-designed to maximize wear life and deliver ideal cutting performance. The discs are made from high-strength austempered steel, a heat-treating process that ensures the steel is thoroughly and evenly tempered for good wear characteristics. Cutting discs rotate toward the center of the platform with the exception of the #3 and #8 discs, which rotate away from center. The paired rotation of the #3 and #8 discs feed crop into the cross auger and help form more uniform edges of the windrow. Wear caps are installed on each end of the cutting disks (except on the end disks where crop accelerators are used) to increase the wear life of the cutting disks and knife bolt nuts. Made of austempered heat-treated ductile steel. Crop accelerators are added to discs 1, 4, 7, and 10. Accelerators on discs 4 and 7 help to help move crop from the diverging area between discs 3-4 and 7-8 and into the conditioning rolls. Wear can be determined when a hole becomes visible in the end or the top of the accelerator and replacement is needed (performance may deteriorate before a hole is visible). The one-piece design includes a heat-treated steel wear cap that protects the knife bolt nut and the end of the cutting disc. Rotary strippers are bolted to the bottom of the inner converging drum on both the left side and right side of the platform. Rotary strippers improve crop flow and convergence to the conditioner and minimize crop recirculation; improving windrow formation and crop quality. 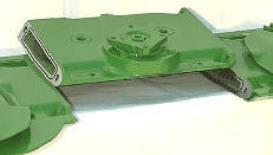 Relocating the stripper to the converging drum provides increased wear life of the converging drum and less buildup of dirt and mud on the cutterbar, delivering lower cost of operation and increased uptime. Rotary strippers are made from high-strength austempered steel for improved wear life. 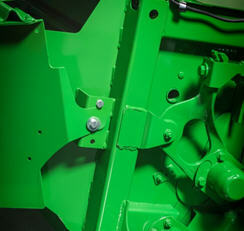 The 500R platform delivers John Deere’s latest advancements in windrow formation and uniformity. 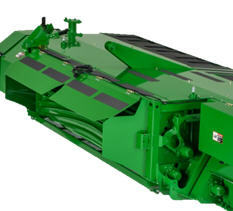 Even, uniform windrows are critical to reducing dry-down times for dry hay and providing consistent chopping speeds and cut lengths for forage harvesting applications. 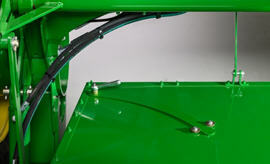 The 500R features an angled frame to help merge the crop into the forming shields. Merging crop directly behind the conditioning rolls provides a smoother transition to the forming shield creating a more uniform windrow. 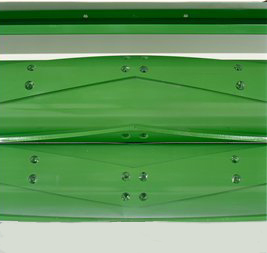 The swathboard is critical to windrow formation as it controls the angle at which the crop contacts the forming shields. The welded pipe connecting the adjustment arm to the swathboard provides rigidity, preventing the swath board from bouncing and causing bunching in the windrow. Forming shields are easily adjusted to control the material flow, allowing the operator to match the windrow width to the harvesting requirements. NOTE: The windrow width depends on the crop conditions and type of conditioner. Attaching the forming shields to the platform is simple. 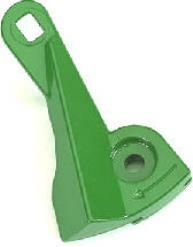 The shields hang on a cantilevered bolt with spacer and are held in place with a single bolt. 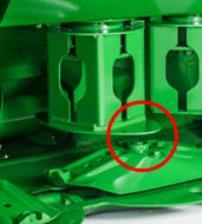 The fluff board at the rear of the forming shields is fixed in the ideal position to deliver optimal performance in all crop conditions. 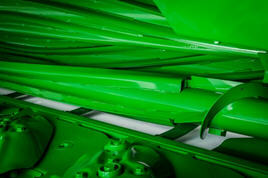 The John Deere-patented-design cutterbar is made from individual, diagonal-cut modules. Servicing the modules is easy; the diagonally cut module design allows the modules to be removed individually while leaving the cutterbar attached to the frame. Idler gears transmit power through the cutterbar, increasing life of the platform and improving uptime. Removing seven bolts (two on each side of the module and three at the rear of the frame) enables a module to be removed from the cutterbar. A rubber ring seals each module to the other and enables a common oil reservoir throughout the cutterbar. The modules are made of high-strength nodular iron castings. Each module consists of two idler gears and one drive gear. The large-diameter idler gears transmit power from module to module. The idler gears turn at a relatively slow speed for added durability. 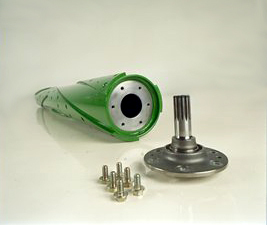 A smaller-diameter pinion drive gear is used only to power the cutting disk. Power is not transmitted from one cutting disk to another except through the large-diameter idler gears. Cutterbar modules are interchangeable across the entire cutterbar. Disc rotation is reversible and determined by the quill position (A) when assembling disc module to the cutterbar. In some conditions, cutting performance can be improved through reversing individual disc rotation.